In Sharon Drusedum and her husband discovered that their luggage was fatally damaged after a flight from Roswell to Cincinnati, Ohio. So they hit up a Samsonite store for a replacement. While checking out, they asked about a warranty and were told they could bring it back to that store anytime. “But we live in New Mexico,” Sharon said. The clerk hesitated, then chirped, “Oh, you can take it to Mexico City. 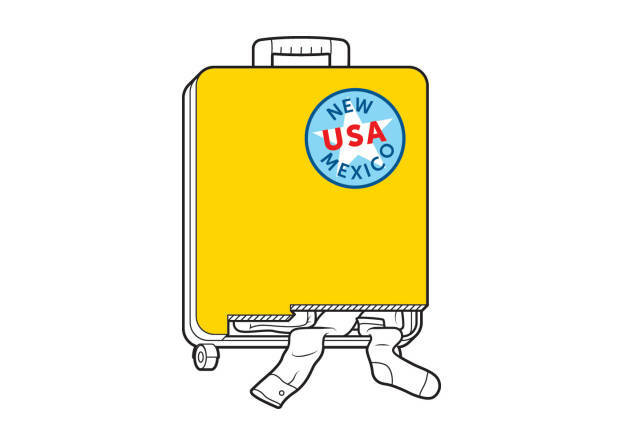 We’re an international company.” The couple were too dumbstruck to offer a geography lesson, but we’re hoping they at least slapped a “New Mexico USA” sticker on the new bag. Nearly Every reader of the magazine alerted us when Gavin Clarkson made national news, not for his campaign for New Mexico secretary of state, but for a District of Columbia fumble. The Las Cruces resident and his then fiancée (now wife) went to D.C.’s Courts Marriage Bureau in November for a marriage license, but the clerk said Clarkson’s driver’s license didn’t prove his identity. She asked for a passport. He protested. And protested. Twenty minutes later, the bureau relented, while all the waiting marital wannabes who had a better grasp of geography rolled their eyes.